Metroid: Samus Returns is coming to 3DS in September - is it the 2D Metroid you've been waiting for? Today was a very good day for Metroid fans: first we got confirmation that Metroid Prime 4 is coming to Nintendo Switch, then Nintendo casually revealed a new sidescrolling Metroid for 3DS. The game called Metroid: Samus Returns is a reboot of Metroid 2: Return of Samus with additional powers, free aiming, and a bunch of other new stuff - and its release date is set for September 15. I've been waiting for a new 2D(ish) Metroid game since Zero Mission came out in 2004, so I'm super excited. Then again, I'm also slightly concerned by the choice of developer; MercurySteam, the studio behind the divisive Castlevania: Lords of Shadow games, is heading up Metroid: Samus Returns. 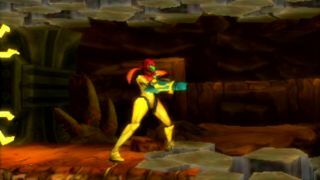 And the last time Nintendo let a third-party studio play around with Metroid we got Other M... So I'll temper my reflexive hype levels to "cautious optimism" for now. What about you? Make sure you check out our full E3 2017 schedule to stay tuned for all the details as they arrive, and check out our roundup of all the E3 2017 trailers.